Day of Russia in Finland. Author Faith Stepanovskaya. Stud Georgenburg. Interview with the deputy general director for horse breeding Yu.Tarasovoy. Historical overview. World Federation of breeding sport horses. About Russian horses in world sport. Effect of blood in the Trakehner Hanoverian breed. Author M. Lobov. Akhal-Teke in sports. Interviews with employees of CSC "Aladzha". His thoughts and observations are divided N.P.Lapshina, world-class athlete in triathlon Alexei Rozanov and his coach E.V.Kaloev (KSK "Aladzha"). Spanish Arabs on Latvian soil. Lippizaner show in America. Interview with Natalia pound. Architecture equestrian facilities. Tourism is changing the face racecourses. Author Todd Grall. T.Gralla - Marketing Director of architectural firm, on projects around the world which has built more than 300 buildings and structures of horseback different scale. Exposure to hand. Author M. Prisco, translated by N. Obukhov: Translation articles familiar to us from the first issue of the Italian coach and rider. (Especially for "Gippomanii"). The foal was born. Authors gl.zootehnik fault them. Chapaev T. Livanov and veterinarian M.Livanova "... Usually foals are born without problems. But ... "- so begins the article on the topical issues of the birth of the foal and the first months of his life. The article contains a lot of individual recommendations, reasoned scientific specialized literature and their own experience of the authors. (Especially for "Gippomanii"). Pushkin, horses and children. Author Vladislav Samara: In Pushkin, near St. Petersburg from May 31 to August 30, Health equestrian center "Sunny Island" and the city administration had a summer horse camp for disabled children and young people from children's homes and boarding schools of St. Petersburg ... (especially for "Gippomanii "). History of horse riding. Bose and the Count d'Or. Author A.Belenkaya: Our horsemen are very similar to the great ... In particular, they rarely accept the "method" works with a horse of his colleagues. About the only personal meeting between the two luminaries, practitioners and theorists riding XIX century, it tells the fascinating author. (Especially for "Gippomanii"). Bronze horses. Author V.Uspensky: An article about the great sculptor who devoted their creativity horses - EA Lancer. Creativity of this master, along with Klodt and Sverchkov - connection example of skill, professionalism and love for the subject of the image. The article is provided with a large number of illustrations - bronzes Lancer. (Especially for "Gippomanii"). Yekaterina Borisova. 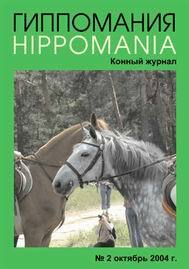 Author A. Nikonov: Article about our contemporaries, the artist who devoted their creativity horses. Her biography says that not necessarily born in the 19th century and to have your own exit, to become a professional in the field of painting horses ... Color photos Catherine works adorn the cover of the magazine. (Especially for "Gippomanii").